This checklist will allow you to run through a quick pre-flight checkup routine to allow for optimal performance in meditation. Adjust your seat height and angle so that your back is relatively straight, and also relaxed. Just let the breath flow naturally in and out of the body, and let the belly move freely with the breathing. Let your spine move with your breathing, so that you can be sure you’re not holding yourself rigidly. Make sure that your hands are supported so that there’s no strain in your shoulders or between the shoulder-blades. Relax your shoulders, letting them roll back to open your chest. Let your shoulders move with your breathing. Take a few deep breaths into the upper chest to allow your chest to open. Relax on the outbreath, but see if you can keep a sense of space across the front of the chest as you do so. Adjust the angle of your head, so that the back of your neck is relaxed, long and open, and your chin is slightly tucked in. Your head should feel like it’s balanced effortlessly atop your spine. Relax your jaw, your tongue, your eyes, and your brow. You’re now ready to begin working on body awareness and relaxation. Thank you for this! It really helped me to get into the ebb and flow of meditation. You should also check out http://www.posturereview.com . It seems to have lots of useful tips on understanding your posture. Highly recommend it. I want to spread knowledge among yoga and meditation practitioners that flexibility in the back legs and hips is FAR more important than abdominal muscle strength in being able to sit in a relaxed position on the floor. Tightness of the hips and back legs results in the abdominals constantly straining to keep the body balanced upright when attempting to sit on the floor with a straight back. Alternatively if the stomach muscles are relaxed for a person with tightness of the hips and back legs, the lower back tends to bow backwards and the upper body slouches forward. The weight of the upper body drooping forward counteracts the tightness of the hips and back legs pulling the lower back backwards so the body reaches a balance that allows the practitioner to sit on the floor without constant exertion. However this position puts strain on the lower back. In either case it’s very difficult to concentrate on mindfulness when struggling against the body. Many western women and probably the majority of western men cannot sit comfortably on the floor because of flexibility. In addition different body geometry, muscular composition, and other factors have an impact. As the author mentioned, sitting on a chair or cushion is a remedy until more flexibility is attained, since when seated on a chair the legs don’t have to bend up so close to the torso. I wasted many years believing instruction that my stomach muscles were too weak to allow me to sit up comfortably. I wondered how this could be so since my stomach was so strong. By chance, after an intensive period of flexibility training, I learned that increased flexiblity can make sitting effortless and result in it involving minimal use of the abdominals at all. A word to shorten your journey. 3 Mindfulness Exercises to Soothe an Anxious Mind | Laura Schenck, M.A. 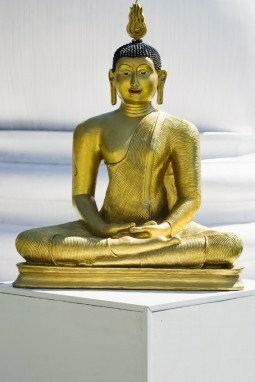 I want to ask a simple question about my meditation posture that can I meditate sitting on the floor? What question would you like to ask, Anirban? Thanks for all the info on posture in this set of pages. Really good to have all the ins and outs, and all the options, explored/explained so clearly. And great to end with this “pre-flight checklist” of the essentials to help me get settled and ready. One thing not on your list, which I sometimes notice I need to do, is to relax the ‘belly’ (diaphragm?) because I can be unconsciously tense there, just like in my shoulders. I’m relatively new to meditating, so maybe it’s a beginner’s (bad) habit! I modified the list a little, and made mention of letting the belly be relaxed. I’d done the same already for the chest, shoulders, and spine, so it makes sense to mention the belly as well. Thanks for the suggestion. Hi there! First of all I just want to give a big warm thank you for this website. It has changed my life. I’ve been meditating for a few months now and I think my posture is good for the most part, but I have so much trouble lately with relaxing my eyes and eyebrows! I feel so much tension when I close my eyes, and telling myself to relax only seems to make it worse because I’m just focusing on how uncomfortable my eyes feel. When I open my eyes a little bit I can relax them completely for some reason. Should I continue to meditate with my eyes open or is it important to keep them closed? If this is the case, do you have any suggestions for relaxing my eyes and eyebrows? I’m glad to hear that this site has been helpful, Shelby. There are a number of things you could do. You could (and this is the easiest, and where I’d suggest starting) work on being aware of everything that’s arising in your visual field. I have an exercise for doing that here. You could pay attention to the change that’s taking place in the sensations in the eyes from moment to moment. If you see your experience as a sequence of moments, forever changing, then the perceptions “pain,” “tension,” and “discomfort” tend to slip out of focus. This approach is compatible with the one above, and in fact you’d have to start with accepting the tension before you could fully focus on the fact of its moment-by-moment change. You could gently steer your awareness elsewhere, allowing yourself to become more focused on, say, the breathing. The sensations in your eyes are something you’d allow to be in your awareness, but on the periphery. At some point you’d probably notice that you’ve forgotten to be tense. This has worked for me when I’ve experienced tension in certain parts of the body.